We have created a mosaics which serve as signage for a number of organisations including Transport for London, Waterloo Action Centre, and Coupette cocktail bar. We were awarded a grant from The Worshipful Company of Weavers to create mosaic portraits of influential people who have spoken at the cathedral. We continue to create new works of mosaic in affiliation with with the cathedral. 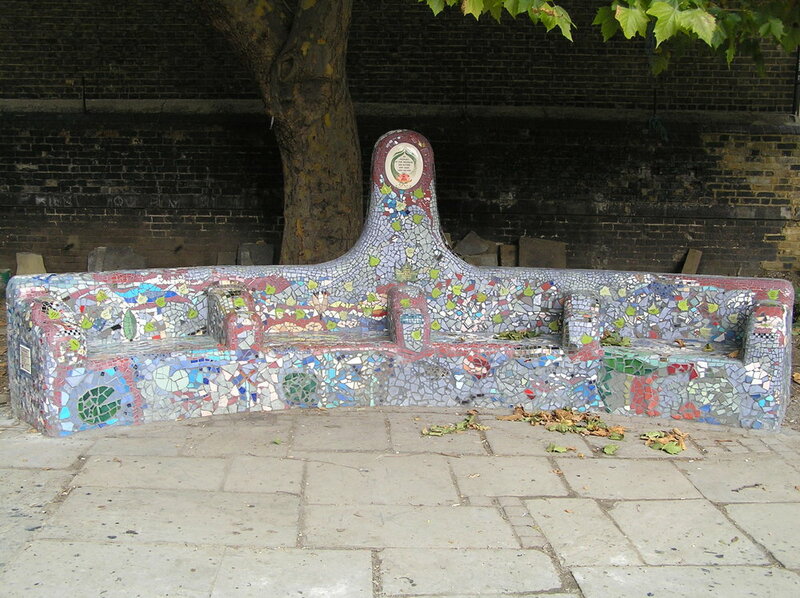 Located at Southbank of river Thames on the railings by Hayes Galleria, this mosaic was created by teams of volunteers including young people in trouble with the law. It depicts medieval London Bridge with its houses, shops, chapels and defences at a time when it was considered a wonder of the world. The bridge was burned down in the great fire of London in 1666 and never regained its notoriety and character, although the new bridge was more efficient in carrying goods and people. Journeys across the old bridge could take over one hour, with people jostling every inch of space and travellers often accosted for unscrupulous payment. We made a series of portraits to enliven the streets of the Southbank. The portraits were of people who had an influence or presence in the Southbank area and celebrated the diversity of artistic, sporting and historical talent: Kelly Holmes, Steve Redgrave, Daley Thompson, Ernie Izzard (boxer from a boxing venue called “The Ring” on The Cut), Bella Burge, Mary Wollstonecraft, Lilian Baylis and Kevin Spacey (which the Southbank Centre removed in 2018). This mosaic was created in collaboration with residents of Hopton Alms House, a retirement house in Southwark. In front of the mosaic is a fig tree which forms the central tree of life motif, with its core heart-shape. Into its branches are the “fruits” or occupations of the residents of the Alms Houses: nurses, sawyers, chefs, clerks, watermen, hairdressers and deal porters. The mosaic includes hand-made ceramic tiles made at the studios, giving it a unique quality.